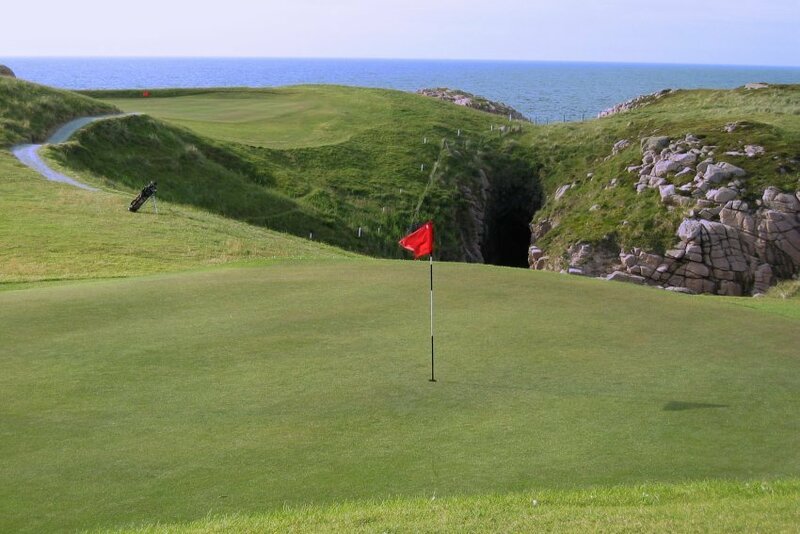 One of the greatest attractions of playing golf in Donegal is that you can find a range of fine 18-hole golf links which are highly scenic, reasonably priced, generally uncrowded, especially in mid-week, and all within easy driving distance of your base at Donegal Thatched Cottages. Below we give a list of these, together with their approximate distance from the cottages, and a contact telephone number in each case to facilitate you in booking tee times. However, our own absolute choice is the widely acclaimed Cruit Island golf links just down the road from Donegal Thatched Cottages. Yes, I know it is only a 9-hole course, but it more than compensates for this by its stunning natural beauty and wonderful sea views. In addition the location of the tee-boxes for the back nine, together with the ever changing wind conditions ensure that you play eighteen different holes every time. This is one course where it is almost impossible not to feel refreshed even if the golf is poor !! Look out for the magnificent par three sixth hole, equally challenging from a different tee-box on the back nine. Look across at the now deserted Owey Island and feel the tug of mixed emotions. Cruit Island tel.074 9543296 — 1 mile.